William had married in Geelong, Victoria, where he father had gone (to seek gold in the goldfields, perhaps!). Eleanor Gawne had gone to Australia with her father and it was in Geelong that William and Eleanor had met, married and had their eldest daughter, Isabella, and son William Henry. On 21 March 1853 William appliad for a grant of land on the south side of the Yarra Yarra River in Melbourne. Printed below from an application to the Victorian Parliament by the Peninsular and Oriental Company for Lease of Wharf Land. APPLICATION OF MR. WILLIAM QUALTROUGII. To the Honourable the Commissioner for Crown Lands. It is my earnest wish and intention to commence business as a Block Maker and Boat Builder, in the City of Melbourne, without delay. You would confer a lasting favor on your humble servant, by granting a piece of land on the south side of the Yarra Yarra River, which will answer my arrangements in every respect. By so doing you will greatly oblige your obedient servant. We certify that. the above William Qualtrough is a most industrious and respectable young man. DANIEL FARRELL, Rate Collector, Bourke Ward. It appears that this was unsuccesful and a couple of years later William and Eleanor returned to the Isle of Man to live in Douglas and bring up their family. William became a prosperous shipbuilder, building many vessels including the "Goldseeker" which it is said he sailed out to Australia and returned again to the Isle of Man. SHIPBUILDING IN THE ISLE OF MAN - ENTERPRISING BUSINESS VENTURE. Once upon a time — and not in the very long ago — ship building was a fairly flourishing industry in the port of Douglas. Towards the middle of the last century a shipyard was in full swing on the site now occupied by the Peveril Hotel. Many sizeable craft were there constructed, and were launched into the bay to the north of the Pollock rocks. Sailing vessels of considerable burden were the principal product of the yard, but not a few hulls which were subsequently fitted for driving by steam power were built, the boilers, engines and machinery being put into them on the other side of the channel. Indeed, one of the Isle of Man Steam Packet Company's ships — the first or second King Orry — was laid down, and so far as timber work was concerned, was completed in the old shipyard, and her performances in connection with the Douglas-Liverpool passenger and mail service were so creditable as to afford her builders good grounds for pluming themselves mightily on their feat in naval architecture and construction. For some reason or other the enterprise either died away or was abandoned, but shipbuilding did not become a dead letter in Douglas for many years afterwards. A yard was established on the Tongue in Douglas harbour by the firm of Vick and Milburn, master shipwrights, who achieved considerable fame in their day. This yard had a great vogue some sixty years ago perchance more. Wooden vessels of various rig were built and launched-schooners, smacks, fishing craft, pleasure boats. Most of these were small of burden, but in at least one case a ship of 450 tons was constructed. This yard, in course of time fell into the category of "has beens," but the industry survived for well on to another half-century. Mr William Qualtrough, a Manx shipwright, a pioneer in connection with the Australian gold diggings, and in this capacity he amassed money which he used, on his return to Douglas, in establishing a shipyard on the southern bank of Douglas river, immediately adjoining Douglas Old Bridge. The yard is still in existence, and is still carried on by a company formed by Mr Qualtrough. For many years past, however, it has lain idle, in consequence of the depression which overtook the shipbuilding trade, so far as the Isle of Man is concerned, about three decades ago. But in his day the late Mr Qualtrough built many staunch craft, which were famous for the excellence of their material and workmanship and seagoing duality, combined with a fair turn of speed. Principally, Mr Qualtrough devoted himself to topsail schooners, and among vessels of this class which he turned out were the Yarra-Yarra, the Emu, the Kangaroo, the Gold-Seeker, the Phoenician, and the William Berey. It will be noticed that the nomenclature of four of these craft was evidently inspired by the builder's sojourn under the Southern Cross. The William Berey was named after a gentleman ,who had the principal ship-broking connection in the Isle of Man, and who was for many years Lloyd's Agent for the Island. These schooners were mainly engaged in the home trade, but on occasions they voyaged to the Baltic, to Scandinavia, the Mediterranean, and the Azores or Western Islands. Their cargoes from the Azores consisted of oranges — in those days the European fruit trade was almost invariably confined to medium-sized sailing vessels. The schooners were commanded by Manx sailors and manned by Manx crews so long as ownership remained in the Isle of Man; but as the years went on the vessels were sold to other quarters, and with their passing the golden age of Douglas merchant shipping ended. Mr Qualtrough also built several nickeys and other fishing craft, which proved very remunerative to their owners during the prosperous period of the Manx herring fishery. Likewise he designed and constructed numerous small pleasure craft. 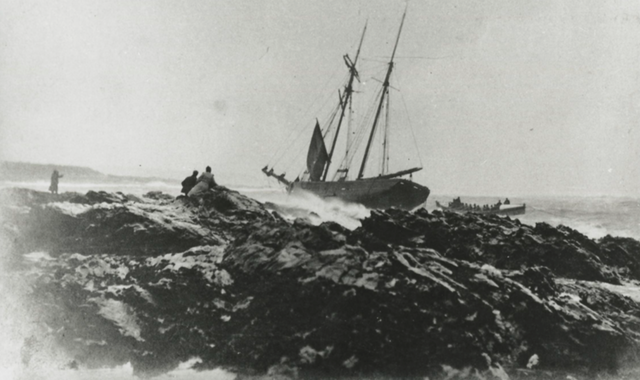 Among these was the twenty-ton cutter yacht Annie, built to the order of the late Mr Sam Lomas, sometime proprietor of the Royal Hotel, Douglas. Annie had very beautiful lilies, and was delightfully fitted. Her owner, one of the most courteous and hospitable gentlemen who ever stepped the Isle of Man, was inordinately proud of her, and he was never so happy as when, accompanied by a party of friends, he was cruising the Manx waters in her. He was a most ardent amateur fisherman, and with a view to engaging in the capture of sea fish he had the yacht fitted with up-to-date gear. His crew were as keen as he was, and as they had a thorough acquaintance with all the good " marks " and with the seasons when prime fish were most abundant on particular grounds, the catches were wont to be of a character which made the mouths of gourmands water. Though that incomparable piscine delicacy, the red mullet, generally avoids waters so northerly as those which surround the Isle of Man, it at a certain spot off Douglas, at a certain time of the year, is to be found, and Mr Lomas and his crew, knowing both the right spot and the right time, not infrequently secured the dainty " woodcock of the sea " — and rejoiced greatly. At least one member of the Annie's crew is still to the fore and in harness, in the person of Mr John Cannell, her sailing master, who is now a sea-going officer of the Isle of Man Steam Packet Company. Other pleasure craft built by Mr Qualtrough were used for the recreation of holiday-makers. The late Mr William Curphey, whose shipyard was also on the bank of Douglas river, directly opposite to Qualtrough's yard, also built a number of small sailing craft. Another master shipbuilder who actively pursued his calling in Douglas during the 'sixties and 'seventies was Mr William Corkill, who specialised in small sailing vessels He gained considerable fame as designer and constructor of Lizzie, which ever engaged in the hire pleasure traffic out of a Manx port. Lizzie was owned by the late Mr Robert Curphey, and almost invariably she secured the winning flag when taking part in matches at Manx regattas. The Douglas shipwrights or ship carpenters of fifty to sixty years ago were a body of craftsmen considerable in number and exclusive of standing. Though they occasionally condescended to associate with journeymen in other trades, they kept very much to themselves as a rule. One justification had they for giving themselves airs. They were the beat-paid workmen in Douglas, their wages as a rule being about 25 per cent. more than the rate obtaining in any other mechanical calling. In their way they were great dandies, and to a period within living memory they on holiday and other high occasions wore clothing distinctive of their occupation. It was a sight for gods and men to observe a shipwright strolling proudly along the Red Pier of a summer night or Sunday afternoon clad in brass buttoned blue pilot cloth pea jacket and waistcoat and duck trousers of spotless white, with silk scarf knotted in nautical fashion around neck, and with peak cap similar of shape and material to that worn in the Royal Navy in those days. He was "some" swell, to be sure. Since the days of depression set in, the shipwright has gradually disappeared from Douglas, until it is doubtful whether a genuine specimen now survives in the town. But for years, after the ship-building industry vanished from Douglas, the art and mystery survived in Peel and Port St. Mary, and even now artificers of the old type, though not gorgeously attired as of yore, are to be found in those towns. So much by way of lengthy and, it is to be feared, tiresome introduction to same account of a movement now on foot for the revival of the Manx Shipbuilding Industry. Let it be at once said that the movement promises very well, . and the prospects are that ere many moons have passed, Douglas will be once more resonant with the pleasant din of shipwrights' axe, adze, maul, and caulker's mallet. Responsible for the effort to revive the industry are Messrs Sutclife, Faragher, Shimmin, a firm which has already done much to stir things up in the Isle of Man during the four years of war. They were the pioneers in the Manx lumber trade. They purchased immense quantities of growing timber in various parts at the Island, and having felled the trees dealt with the trunks in a manner best calculated to bring about satisfactory financial result. Many thousands of tons of pit props were exported, besides much other timber available for other industrial uses and for military use. So heavy were the exports and so scarce was the shipping on charter that the firm were compelled to strike out in another line that. of shipowners. They acquired by base a small fleet of vessels, with which they traded between Manx and inland ports mainly in connection with the carriage of timber; and the experience thus obtained has in all probability fired them to build ships at first hand. There can be no doubt but that their enterprise will prove of benefit to the Isle of Man and Douglas in particular. Of great importance in connection with reconstruction and the provision of employment for men who have served the Country during the great war is the founding of new industries and the revival of industries that have either languished or disappeared. The Manx are essentially maritime of instinct, and what could ,tend to greater national benefit than the restoration of shipbuilding? Accordingly Messrs Sutcliffe, Faragher, and Shimmin have set themselves to revival, and all the indications are that they have so taken up the task that success should be but a matter of a short time. The difficulty of securing skilled labour has to some extent been overcome already. The firm have been fortunate in retaining the services as manager of their shipbuilding department of Mr T. Arthur Miller, who has had a complete training to and long experience in the business. He carried on a shipyard in Port St. Mary and therein built a number of goodly vessels. Also they have secured a sufficiency of practical shipwrights-Manxmen all-who will at any mate tide them over the initial stages of the undertaking. The firm's shipyard will be situate on the Tongue, and a more convenient locality could not be found about the port. As has been stated, the. Tongue was formerly used for ship construction to considerable extent, and it is just as suitable now for the purpose as ever it was. Messrs Sutcliffe, Faragher, and Shimmin have arranged with the Isle of Man Harbour Commissioners for the use of a considerable strip of land extending from the Public Mortuary seawards, and have erected all the, enclosures, sheds and workshops necessary for building and launching purposes. Launching must necessarily be of the " side on" description as distinguished from the customary "stern on" method of sending a ship into the water. That this is so is due to the narrowness of the yard -there is abundance of length but a shortage of width. A " side on" launch demands much more delicate and skilful handling than does a launch of the "stern on" variety; but with capable men, such as the firm have command of, there is no insuperable difficulty presented-all of the launches from Qualtrough's yard were side launches, and all of them went off without a hitch. In connection with the yard there will be a steam plant for bending the timbers used in construction; a complete electric installation to be used for lighting, power and mechanical purposes; a sawmill, and other necessary adjuncts. It is the intention to place upon the stocks immediately a vessel of some size which the firm are building on their own behalf. The vessel is to be employed in the fishing, and is so designed that when completed she can be used either as a trawler of a drifter. The hull is to be constructed of wood. Oak is to be the material employed for keel, keelson, frame and beams. The deck planking is to be of larch, and the side planking of oak and larch. The dimensions contemplated are as follows:-Length between perpendiculars, 85 feet; length over all, 93 feet; beam, 19 feet; depth, 10 feet 3 inches. The tonnage of the vessel will be about 45 nett and 95 gross. Mr J. A. McCallum, naval architect, Glasgow, has supplied the designs which have been approved for purposes of classification at Lloyds. She is to be driven by steam power applied to a single screw propeller. The boilers and machinery will be of the latest make, and the latter are to develop 25 nominal horse-power indicating up to about 173. It is interesting to note that all the timber which enters into the con-struction of the hull is of Manx growth. The firm in connection with their tree-felling operations were careful to reserve the trunks of best quality, with the result that they have now in store at Quiggin and Company's Lake Yard enough timber to build several vessels. All this stored wood has been seasoning for from two to four years, so that it should be in fine condition for construction purposes. An inspection of the store is calculated to surprise those people who were under the impression that no trees of any size could be grown in the Isle of Man. As a matter of fact, Messrs Sutoliffe, Faragher and Shimmin have laid low an immense number of arboreal monsters. There is Manx oak in plenty-one veteran trunk is of great length and immense girth. The estimated age of this particular tree is 250 years. It came from Glentrammon along with many other serviceable trunks. Also to be seen are several magnificent sycamores, Spanish chestnuts, Scotch firs, and white and red elms. From the firm's point of view, perhaps, the most important stock is that of larch. This tree flourishes uncommonly well in the Isle of Man and attains great size both as to height and girth. Also the quality of Manx larch is admitted to be unsurpassable. Many of the trunks in Quiggin's yard are over fifty feet long — one which came from Glen Helen measures 53 feet. The firm have secured for purposes of making the moulds in connection with the new vessel's frame timbers, the use of the covered rope-walk, which has a remarkably fine floor, and is in every way well suited for this important operation. Everything, in fact, is well in train for the building of the new ship, and it is hoped that she may be but the precursor of many others. Should the industry be well-established-and with the present huge demand for shipping there is no reason why it should not be-it will be a splendid thing for the Isle of Man, in that it will afford an opportunity for many Manx boys of acquiring a good trade. One of the greatest drawbacks to residence in the Island is the lack of opportunity of being trained in a useful calling in life. Well the trades of shipwright and ship-smith are among the most useful that are going, and are very well-paid whether followed ashore in a yard, or afloat in the King's Navy or the Mercantile Marine. More power, then, to the new venture. All being well, Manx people should within the next few months have the opportunity afforded them of witnessing a ship passing over well-greased ways laid from the yard into Douglas river. And a launch is a sight well worth seeing.